COMMENT – Do you remember how Baldrick was forever offering Blackadder his latest ‘cunning plan’? And how these plans invariably ended up being totally ludicrous, like the one in Blackadder III, in which Baldrick suggests they replace the (supposed) burned copy of Dr Johnson’s first dictionary by writing an entirely new one overnight. I raise this, because it seems to be a feature of members of the ConDem government that they are perfectly happy to spout ideas which sensible people would shoot down in flames as entirely stupid. In an article about Michael Gove in the Guardian of 5th October 2012, Decca Aitkenhead revealed that he “proposes the marketisation of immigration policy, whereby a British passport could, he suggests, be sold for £10,000.” Having thought about this astonishing idea for more than the few seconds which Gove himself must have devoted to it, I can only imagine that in his gross naivety he believes that the buyers of these passports would merely be good folk who would bring their wealth, expertise and genuine humanity to our shores and to the massive benefit of our nation. I say this because he clearly didn’t expand his vision to encapsulate people like – say – Russian mafia types who might want to expand their marvellous drug and vice empires. 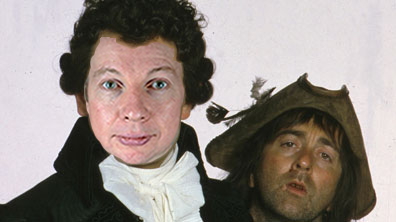 Gove needed only to say the words ‘I have a cunning plan’ in explaining this outstandingly awful idea to Cameron and his role as the malodorous, incredibly dense sidekick would be complete. I have no idea, by the way, of the effectiveness of Gove’s personal hygiene regime, I only know that his ideas stink. It’s views and ideas like this one that make me even more worried about the war of destruction that Gove is happily waging on the state education system. I think I’m right to be so worried and Aitkenhead’s article offers me even more grounds for my concern. Aitkenhead reckons that Gove is ‘affectionately indulged’ in Westminster because of his ‘charm’. Interestingly, Decca must have the ability to read other people’s thoughts, because she then says “If you have never met the secretary of state for education, and do not vote Tory, you may well be of the view that Gove is a nasty little rightwinger with a reactionary vision to return Britain to the 1950s.” That’s exactly what I think of him! Whoever would have believed it? She should have her own ‘Mystic Meg’ style spot on the national lottery show. Anyway, the portrait she goes on to paint, derived from what those who know him say about him, is of an inordinately polite, old-fashioned fogey who yearns for t’good old days and who is apparently trying to re-create them via his trashing of the education system. Now, there’s nothing at all wrong with good manners – though some of his appearances before the Commons Select committee belie his reputation in this area, because his self-righteous smuggery and his attitude of ‘I’m always right, how could you possibly think otherwise?’ suggest a person who views those with differing opinions with something approaching contempt. How else, moreover, can we explain his abject refusal to take advice when it contradicts his intentions? I’ll give you an example. In his headlong rush to throw our GCSEs (which were road-tested in pilots extensively before their introduction as the standard examination for 16 year olds), he has refused to accept the advice that the new ‘English Baccalaureate’ – which I predict, in Mystic Decca fashion, will swiftly be renamed the ‘English Wotsit’ – must be subjected to stringent and rigorous pilots. Glenys Stacey, head of Ofqual, has spoken of her concerns about the timetable for implementation of the new exams and Graham Stuart, head of the Commons Select Committee, has urged Gove to “Stop taking the urgency pills” and remarked that proposed reforms “lack coherent thinking”. Stuart illustrated his remarks by describing the introduction by Labour of the vocational diplomas as “A car crash” – because, he said, introducing a new qualification – according to the awarding bodies – takes ten years. As a head at the time the diplomas began to be introduced, I recall ranting regularly at meetings both in school and with other colleagues elsewhere, that Labour’s timetable for the introduction of a large number of these diplomas was entirely daft. In fact, I said regularly at my own leadership meetings that it was “Never going to happen.” Now, whilst it’s excellent for someone as opinionated as me to bask in the glow of my own prescience and good sense, we have yet another example of Gove failing to learn from the examples of the history he believes is a subject no-one should get through life without studying. The DfE’s response to the soothsayers on the moss-free rolling stone that is the English Wotsit is that there are ‘deep problems’ with the existing GCSEs and we all know this, so why don’t we all stop whining and accept a totally unpiloted, brand new, rushed-out-as-if-to-save-lives set of exams, because they’re bound to be better than GCSEs, aren’t they? We’re encouraged to believe, according to Aitkenhead, that Gove is on a kind of mission to offer all working class children the sort of chances he had. Now, fashioning education policy according to what you liked, didn’t like and feel made you the person you are has long been central to the activities of a long line of education secretaries; indeed, the original National Curriculum, offering an ‘entitlement’ to all state school pupils (those at independent schools not needing this ‘entitlement’, however) to study exactly the same subjects, the topics thereof designed by self-interested committees with the remit ‘fill it up, these urchins have far too much time on their hands’, was apparently borne of the then Tory government’s belief that comprehensives taught endless lessons aimed at converting their pupils to Trotskyism. As a pupil at one of the larger comprehensives during the 70s, I can honestly say that the only time politics ever popped up in a lesson was during sixth form ‘General Studies’. A module called ‘Economics’ consisted of one of the assistant heads slagging off ‘Wedgie Benn’ and telling us how marvellous the Tories were because ‘They’ve all got money and so they know how to run the economy’. Gove has shown us already how keen he is to restore some of the features of schools of yore because he thinks this will lead to greater social mobility. There’s no point my even discussing the fallacy that creating more grammar schools (either ‘real’ grammar schools or their faux version in the form of academies and free school) will ‘give a leg up’ to bright but poor children, because we all know that the genie is out of the bottle as far as the middle classes are concerned – their children already have a massive advantage and all they need to do is pay for the extra coaching required to get their kids through whichever selection tests are used. I found this part of Aitkenhead’s article extremely interesting as regards Gove’s motivation: “His view on social mobility is for people to do what he did – study classical subjects and go to Oxford,” argues a Labour critic. “It’s all slightly ‘Some working-class people are terribly good at Latin – give them a chance and you never know! '” I’m a working class person who was given the chance to study Greek and Latin at my comprehensive and was good at it; but the notion that it was studying either of these subjects per se (do you see what I did just there?) that led to my successful climbing of the social mobility ladder is complete nonsense. Like Michael Gove, the helping hands up the ladder belonged to my parents; and what keeps some working class children off the ladder entirely is, similarly, what they do not get from their parents. What is the Latin for “nail”, “head” and “hit”?